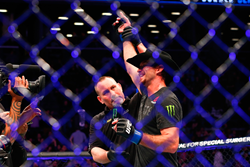 Monster Energy congratulates Donald “Cowboy” Cerrone on his win against Alexander Hernandez via a second round TKO stoppage at UFC Fight Night 143 inside Barclays Center in Brooklyn, New York featured on the debut of ESPN+ 1. Not only did Cerrone improve his record of the most wins in UFC history, but he also made sure UFC’s unveiling on ESPN got off to a great start with his dominant performance. In front of a rowdy crowd Cerrone devoured the highly hyped-up young talent, Hernandez with a series of brutal blows over two rounds earning his 16th career finish. For this fight Cerrone returned to the lightweight division (his original fighting weight division) after testing welterweight, which didn’t work out as good for him after he lost five of the 10 fights he fought at welterweight. For the first round Hernandez started of strong landing a big uppercut, but Cerrone shook it off, settled in and never looked back punishing Hernandez with jabs, a few brutal elbows and finished him with a nasty head kick that put Hernandez down. Then more punches from Cerrone forced the referee to step in for the second-round TKO stoppage. Cerrone’s lightweight victory comes on the heels of his feat in November where he impressively finished Mike Perry in the first round with a vicious armbar in the welterweight division. Donald “Cowboy” Cerrone is amongst Monster Energy’s elite UFC team along with, Jon Jones, Conor “The Notorious” McGregor, Daniel Cormier, Dominick “Dominator” Cruz, Chris ‘The All American’ Weidman, Tyron “The Chosen One” Woodley, Max Holloway, Yair Rodriquez, Jessica-Rose Clark, Li Jingliang, Gökhan Saki, Rose Namajunas, Cris Cyborg and new to the Monster Energy MMA team T.J. Dillashaw. For more on Cerrone and Monster Energy’s MMA athletes visit http://www.monsterenergy.com. Follow Monster Energy on YouTube, Facebook, Instagram and Twitter.